One question hung in the air as the Crested Butte Titans hockey team took the ice against Coronado Cougars on Friday, February 2. Could they continue on the path they established in their games the weekend before? Granted, they dropped both of their two games to the all-powerful Valor Christian Eagles the weekend before, but they hung tough with the Eagles in the first game, actually striking first before falling 4-1. Coach Jake Johnstone even pointed out that it might have been the most complete game he’s seen his team play all season. But Coronado is a different beast, and one that tends to haunt Titan teams, no matter what the sport. The Cougars sit two spots below the Titans in the standings and Crested Butte opened the season skating to a 5-1 win over Coronado. Basically, Coronado is one of many programs in many sports that the Titans tend to play down to rather than dominate. And after the first five minutes it appeared that the Titans would fall prey to hubris as they were noticeably flat-footed and disjointed. Goalie Clayton Freed came up with a couple of key saves early but the Cougars continued to get clean looks on net and cracked the seal six minutes into the game to take a 1-0 lead. “It was the same thing we always talk about: Don’t play down to your opponent,” says Johnstone. Things teetered on, going from bad to worse but the Titans got a boost a minute later as Joe Coburn dug the puck out of the corner in the Cougars’ zone and found Hunter Wright open in the high slot with a pass and Wright fired the puck past the Cougar goalie to tie the game. The Titans stepped up the pace to start taking control of the momentum but the Cougars continued to hang in there as Crested Butte remained a bit off-kilter. The speed advantage of the Titans would bail them out though and they eventually turned the corner in the final four minutes of the first period to take complete control. Dylan Frazier sprinted up-ice with the puck to catch the Cougar defense out of position and then dropped the puck to Sam Stepanek, who followed the play to score. A penalty on the Titans may have disrupted their mojo temporarily but their penalty kill has been a source of inspiration all season and they killed off the penalty with ease. Just as Ted Trujillo finished serving his two minutes, he stepped on the ice to take the puck and skate into the Cougar zone, drawing their defensemen. Trujillo took a quick look up and found Kaden Hardesty wide open with a pass and Hardesty finished for a 3-1 Titans lead to close the first period. “We were able to bounce back and we moved the puck really well, I thought,” says Johnstone. The Titans penalty kill set the tone once again in the second period as the Cougars spent four of the first five minutes with a man advantage, only to come up empty. 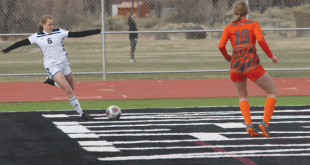 Once back to full strength, the Titans continued to out-pace Coronado and net a fourth goal as Hardesty scored off assists from Trujillo and Frazier. The three Titans then struck again three minutes later during another Titans penalty kill, as Trujillo and Frazier worked to set up Hardesty for his third goal of the game and a 5-1 Titans lead. The Cougars would eventually score six minutes into the third period but it was too little too late. Luke Collins capped the win for the Titans, skating to net and slipping the puck high near post for the 6-2 Titans win. Freed finished the game stopping 32 of 34 Coronado shots. The Titans returned to the ice on Saturday, February 3 to host the Rampart Rams. 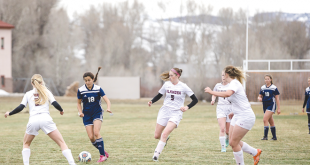 Crested Butte edged out a 5-4 win over Rampart earlier in the season, so vengeance was first and foremost in the Rams’ minds. The two teams played through a scoreless first period but Rampart broke the tie four minutes into the second period and held on to their lead going into the third. Johnstone made some adjustments to his lines and shortened his bench in the third period and the move ultimately paid off as John Smith scored 10 minutes into the third period to tie the game. The teams then fought through the remainder of the third period and into overtime but neither managed to decide the game and finished with a 1-1 tie. Shaughn Rourke finished the game stopping 42 of 43 Rampart shots. The recent warm weather has affected Titan workouts this week as they prepare for two road games against the Castle View Sabercats this weekend.